Imagine not being able to see or speak. Imagine having no control over your actions or what you say. Imagine what life would be like missing a limb or being handicapped. Diners at Russell’s Restaurant on the College of Southern Nevada’s Cheyenne campus had the opportunity to experience disabilities, which they were assigned that evening. 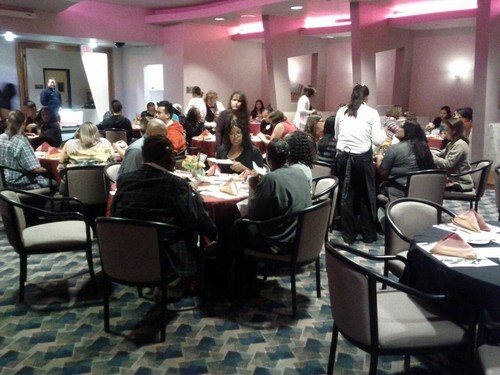 This took place during a Disability Resource Center event on Nov. 8, 2012. Sharnee Walker, disability specialist at CSN, hosted the second annual DRC event that gave people the opportunity to experience what having a disability is like. Each guest was given a free meal and also given an envelope that contained a disability he or she had to act out during the dinner. Specific instructions and items were passed out. Masks and goggles were given to some to demonstrate blindness and bad vision. Headphones were given to some to block sound to demonstrate deafness. Cues were given to others to act out hyper-active and obsessive-compulsive disorders. One of the guests Santarpia McNeil, ReEntry Program specialist at CSN, was assigned the role of a right-arm amputee during the event. When asked what it was like, she said that she needed assistance during the meal and that she couldn’t imagine doing other activities. Another guest Quinetta Crawford, a student, was assigned an attention-deficit disorder and felt she was in every conversation due to this disorder. “It was very challenging and gave me a new outlook for disabilities,” Crawford said. The guests were not the only ones part of the experience; the waiters also participated unbeknownst to the attendees. They were secretly told to either over or under accomadate guests depending on their disabilities so that they could have authentic experiences. Beovonni Glover, one of the waiters at Russell’s, said, “It was very interesting, fun, and exciting.” He did not find it hard to accomadate the guests with disabilities. Beyond this evening at Russell’s, when CSN has events the DRC makes sure to accommodate people with disabilities. For example, at a baseball game the DRC will provide transcripts. Special needs can be arranged for students through the DRC. Contact the DRC at http://www.csn.edu/pages/544.asp.